Life Before the Dinosaurs: Mixopterus. Mixopterus was a peculiar genus of eurypterid that lived in the late Silurian Period. 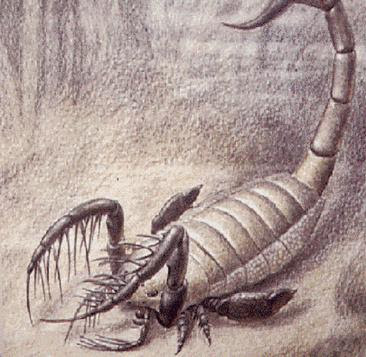 Its spiny claws were similar to those of the Ordovician eurypterid Megalograptus. Thanks to Wade Harrell for the cool illustration! At the posterior end, Mixopterus has a stinger that it could have used to injure or kill its prey before eating it, like scorpions do today. Mixopterus was a type of arthropod called a eurypterid. In the Silurian, eurypterids like Mixopterus were the top predators. It was about 75 centimeters long and was found in Norway. Mixopterus had a very bumpy exoskeleton and spiny legs. It probably kept its stinger raised above its head like scorpions do. 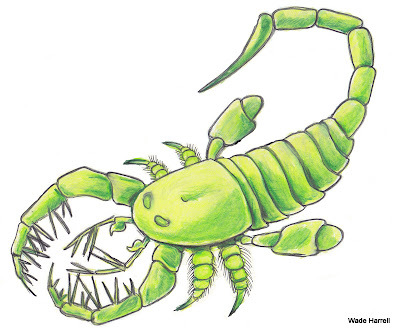 Eurypterids like Mixopterus are believed to be related to horseshoe crabs and scorpions.